One of the first major decisions that faces us is what board should I go with? inflatable paddle board vs hard board? Unfortunately I cannot tell you what is better right off the bat. What I can tell you is which best suits a particular lifestyle. I even tried them head to head where I was on my inflatable touring board and my friend was on his Rental board. I noticed that my paddling strokes had to be deeper and more thorough just to keep up the pace with him when paddling towards the pier. I asked myself the same question last year although pretty quickly it was clear that an inflatable paddle board was the right choice for me. Looking back I definitely made the right type of board choice but should of bought from a more distinguished brand. I say this because I bought my board new off of craigslist and while the board is good quality the paddle falls short in that department. The adjusting knob on the paddle keeps locking and the top handle has come off once while paddling 🙁 . It is a nice looking paddle board though! Inflatable Paddle Boards are a heck of a lot more durable than hard boards. I realised I may have just surprised you there so let me give you a few moments to recover from that statement. Good? 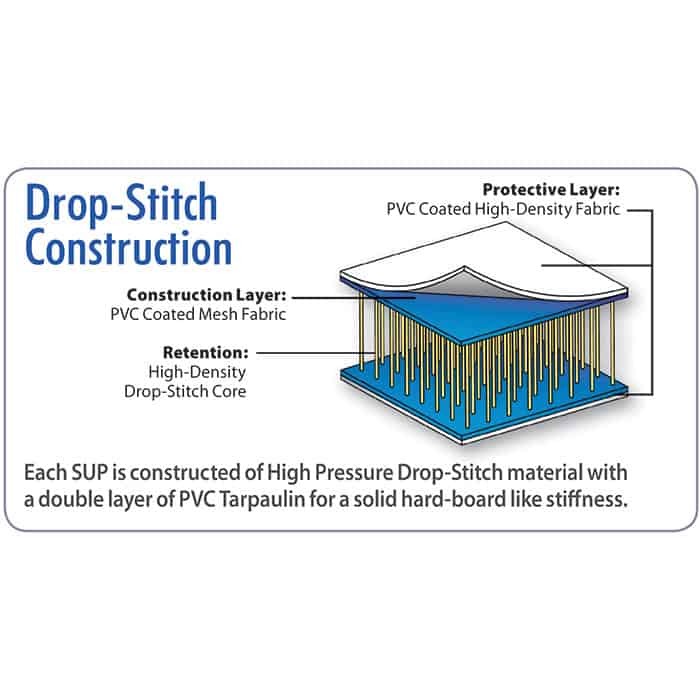 Ok.
Drop Stitch Construction is a process where two layers of material are tied together by a large number of very thin threads on the inside of the board. It is not air tight however so there must be an outer layer of PVC that is glued or laminated on the top and bottom of the drop stitch material. The more air (or higher the PSI) the more rigid the board is. Good inflatable paddle boards feature at least 5 (preferably 6) inches of thickness. It should at least be this thick because it holds its form on the water better and does not sink in the middle provided it is inflated to the right PSI. Inflatable Paddle Board recommended PSI is usually in the range of 17 to 25 PSI but make sure you read the manufacturer’s instructions when it comes to this. My board operates best within the 17 to 22 PSI Range. Hard paddle boards (or fiberglass boards) are more delicate due to their construction inside. If there is a crack on the outside of the board it can effectively ruin the EPS Foam composition on the inside by being water logged. This makes it less buoyant and as a result ruins the board. Inflatable Paddle Boards are in my opinion the best boards for beginners for a variety of different reasons. A high quality inflatable paddle board will run you anywhere in the neighborhood of $450- $800. A high quality hard paddle board is more expensive. You are looking in the range of at least $800 -$1500 + easily. Quality brands that have a reputation can easily reach into the $2000 range. 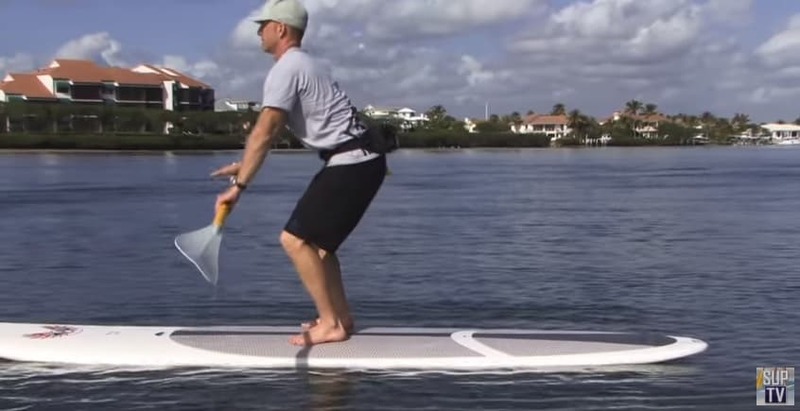 Inflatable SUP’s are also safer to use than hard boards. For one if you fall, the impact will not be as great onto your limbs or even your head. This is especially crucial if you are trying exercises such as Yoga SUP or are a newcomer on the paddle board scene. The are also easier to spot in the water because they sit above the water level. This is one of the categories where inflatable SUPs are the clear winners. They just take up less space! If you live in an area where there is a winter climate like I do, then it is important that you have a board that does not take up a heck of a lot of room. Inflatable Paddle Boards can simply be deflated and rolled up to the size of a hockey bag. Most Inflatable SUP’s come with some sort of bag that you can put it in so that it does not unravel. Compare this to hard fiberglass paddle boards that take up significantly more room (I’m talking at least a space of 9 feet by 3 feet wide). For people who live in smaller houses or apartments an inflatable SUP is the way to go unless you are willing to get a storage locker for the bigger fiberglass paddle board. There is no way around it. Inflatable SUP’s are a lot more portable and transportation friendly. If you have a car an inflatable paddle board can fit in the trunk, back seat or front seat. You can even bring an inflatable SUP with you on the plane. although check the airplane luggage dimensions before committing to this. Fiberglass Paddle Boards are for people who have the money, space and time to go paddling frequently. 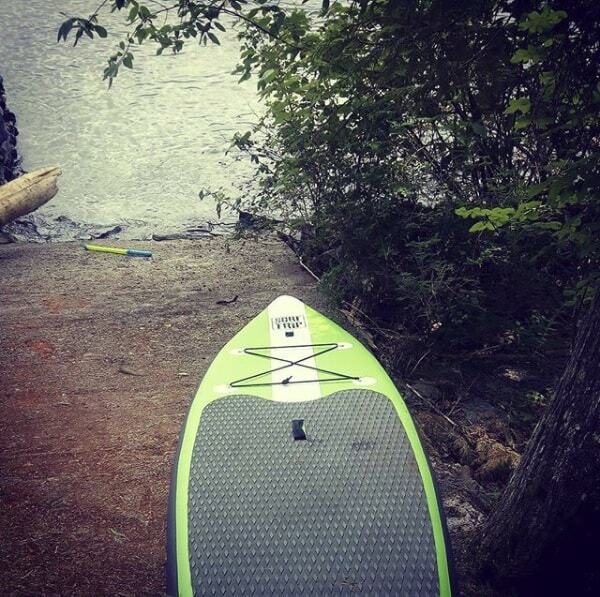 Hard boards are just better suited for the water than inflatable paddle boards. I can even attest to this as it took much less effort to paddle faster in the water with a rental board than it did with my inflatable board that I bought. Inflatable Paddle boards have gotten better and better as time has gone on but you still cannot compare the on water performance of a hard fiberglass paddle board to an inflatable SUP. Fiberglass boards glide through the water and are partially submerged in the water while Inflatables stay on top of the water. As a result fiberglass boards react better to external conditions such as waves and allow you to stay more balanced while inflatables glide over the water and do not absorb the impact of the waves. Hard boards are also a lot more manoeuvrable and responsive in the water compared to their inflatable cousins. There is no doubt that quality hard boards are rigid throughout their composition as opposed to and inflatable. Yes Inflatable paddle boards have taken leaps and bounds in the past 20 years in this regard but air will never create a harder surface than fiberglass. As a result of being more rigid the hard board reacts better to the paddler and its environment. These Hard Paddle Boards are made of a combination of multiple layers of Fiberglass and EPS foam and an epoxy finish to protect the board from minor dings. Fiberglass SUP’s just feel more stable when you are on them. That is because they are partially in the water instead of sitting on top. So when a wave comes at you the board absorbs the wave instead of ridding on top of it. You are also much closer to the water and do not feel as high up when paddling. These differences though are relatively minute as there are some very sturdy inflatable boards available. The wider the board the more stable it feels on the water. Hard boards have more weight to them and sit in the water instead of on top. This makes them become part of the wave instead of riding on top of it. Riding a wave on a SUP takes a lot of practice mind you, many who succeed at it have a surfing background already. I know this first hand as I had to exert more effort with my inflatable board to catch up to my friend on his hard board. A good quality Fiberglass Touring board is a bit faster than an inflatable touring board by about 5.6%. Isle did a full test on this and the difference to the recreational paddler is pretty minimal. Still if you are serious about your paddle boarding and want to cover longer distance the Fiberglass model is better suited for you. To summarise all of this. An inflatable paddle board is a lot more practical for the causal paddler because it is more durable, cost effective, safe, storage friendly, portable and beginner friendly. Good quality brands can last years and gives you a lot of paddling time in the water. 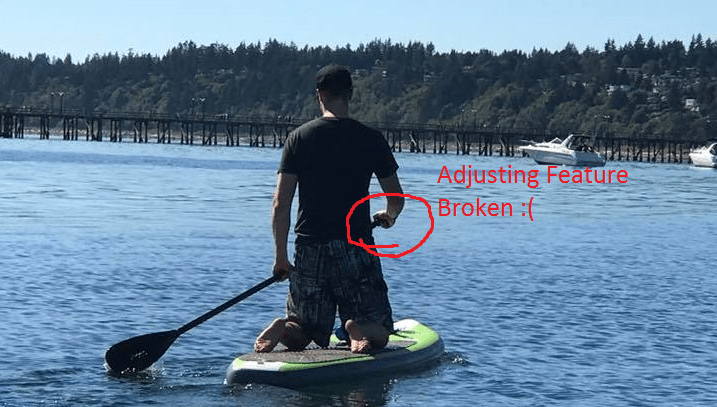 On water difference between an inflatable SUP and a Fiberglass board is not as wide as you think. 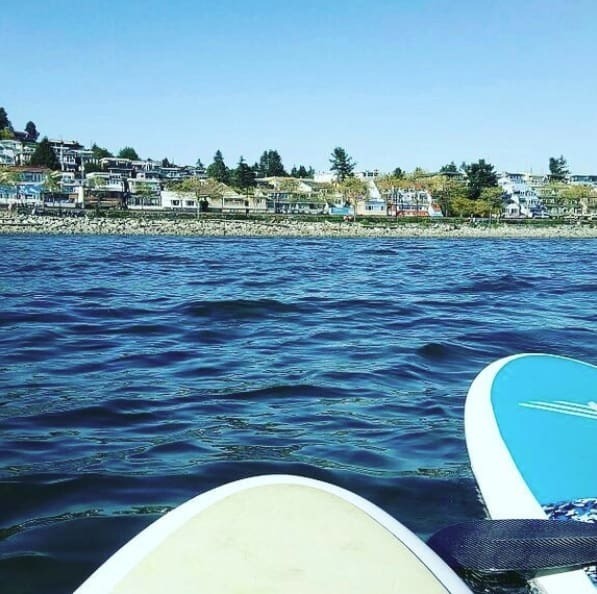 If you do however, plan to get serious into paddle boarding and want to make it a way of life I would recommend that you spend the extra money and get a hard fiberglass board. From here there are many different boards you can get for different purposes. Take a look at some of my recommended best paddle boards. Paddle boards are more companion than hard boats as it increases the grip of the body and make body muscular well as it is safer, portable and price for paddle boards are low as compared to hard boats which is affordable to everyone.